Running at Phansi Museum in Durban in an exhibition of beaded cloths by Billy and Jane Makhubele. This husband and wife team designs and makes colourful artworks based on historic events which occurred in South Africa. Both are in love with the democratic changes that have taken place in South Africa since 1994. 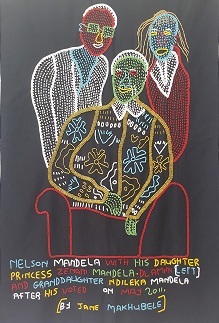 Billy designs the piece and Jane (as well as Billy’s other wife, Jamina) and his seven daughters create the artworks out of beads, pins, mirrors and other objects on cloth. Jane is famous for her spectacular decorated capes which she turns into beaded artworks inspired by newspaper clippings of precious events and stories they find in the media. The Makhubeles live in a rural area in the Limpopo province. Jane copies the words and texts from newspaper captions and together with Billy design and create innovative beadwork. Billy Makhubele was a pioneer in the making of wire sculpture and was selected to represent South Africa at the Valparaiso Biennale in Chile in 1985. He was one of the curators (with Nessa Leibhammer, previously from the Johannesburg Art Gallery and Natalie Knight) of Dungamanzi/Stirring Waters, an exhibition of Tsonga/Shangaan art and culture. The exhibition was held in Johannesburg in 2007 and during 2008 at the National Galleries in Cape Town and Bloemfontein. In addition, Billy Makhubele is respected as a collector of rare beaded artworks and items of clothing of the Ndebele and Shangaan. Many of these items are today preserved in major public collections in South Africa. Phansi Museum holds a collection of shawls of the Tsonga -Shangaan of Limpopo in its collection, which are permanently on display. The art works produced by the Makhubele family are represented in numerous museums and public collections in South Africa.